President Raul Castro is now attending a mass officiated by Pope Francis in the eastern city of Holguin, second leg of his Cuba papal visit, which will conclude in Santiago de Cuba. Raul was also present at the Holy Mass yesterday in Havana, which was attended by tens of thousands of Cubans and pilgrimages from different countries, who gathered at the Revolution Square to meet the Holy Father. 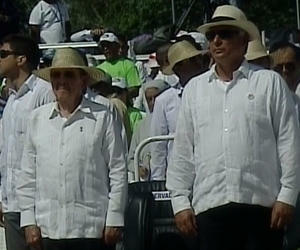 On Monday Morning, the Pope came to Holguin largest square after being warmly welcomed by the people packed in the place. In the afternoon today, the Holy Father will bless the city of Holguin in a simple ceremony that will be a landmark in local history.